The demand for cane sugar is directly dependent on the growth of the sugarcane industry in developing countries, like China, India, and Indonesia. The rising demand for sugar is also fueled by the heavy demand for ethanol. Ethanol production is expected to achieve an average growth rate of 6% per annum by 2023. However, as ethanol also competes with gasoline as a transport fuel, a drop in the prices of gasoline as a result of lower oil prices will tend to lower ethanol prices and hence, lower the demand for sugar to produce ethanol. Over the last few decades, the consumption of added sugar (sugar not contained in natural products, like fruit or milk) or high-fructose corn syrup has increased dramatically. South America is the origin for over half of the world's total sugar exports, with Brazil being the dominant supplier, particularly for raw sugar. It is also the largest producer of sugar in the world, producing around 36 million tons per year, which accounts for 25% of the worldwide production and about 50% of world exports. Sugarcane is a very important crop for Brazil and is especially used for ethanol production. However, some irregularities in industries related to the production affect the Brazilian ethanol exportation. Government also has an influence on prices of sugar and issues export subsidies, minimum fair prices, and ethanol mandates to support the local market and because of the effect of these factors on sugar prices, the product is one of the most difficult commodities to trade. The worldwide trade in sugar is around 20-25% of aggregate world demand, this is high when contrasted with different commodities in which exchange is typically 10-20% of world request. Prior exchange was mostly among governments and that too through long-term contracts. In recent decades, sugar exchange has been changed and it is now more liberalized. The way that the market is more open now has impacted sugar prices too. 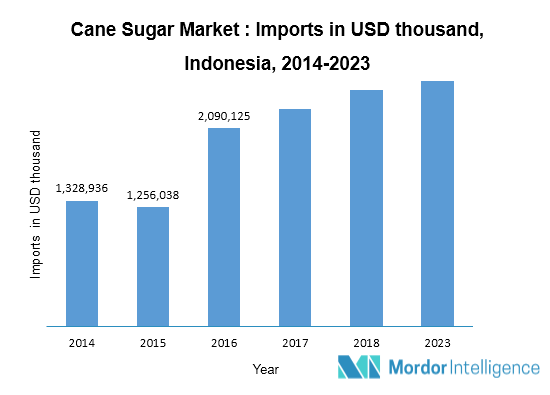 Indonesia, which is a major importer of cane sugar, imported USD 1,256,038 thousand of sugar in the year 2015 and USD 2,090,125 thousand out of 2016, its best 5 exporters being Thailand, Brazil, Australia, Argentina, and Guatemala.